My experience with NaNoWriMo last month showed me that, even if I failed at the goal of the actual project itself, I kept up with my weblog about the experience pretty well. And I've read so many improv journals that other people have kept, I thought it was about time I did one (and since the rehearsal process for this show is so tight, it's not a very long-term committment). Back in April, Bare (which is Shaun Himmerick and me) went to the first Columbia Improv Festival in Columbia, South Carolina. Shaun and I had both met Armando Diaz before, but briefly. At the festival we got to know Armando better and performed with him a few times. Over the year, Shaun has kept up an email correspondence with Armando and proposed to him that when he was coming to Chicago to visit family for the holidays, he should come out a week early and direct a show. He agreed. I don't know all of Shaun's conversation with Armando, but I believe they decided on the Eventé form for the show because it was a form that Armando had previously directed a New York cast in, so it would be easier to direct in a week than a form that was brand-new to the cast and director. So the plan is that we'll have Armando for one week of three hour rehearsals every night, then put up the show in the new year (The run starts Jan. 5! Come see the show!). 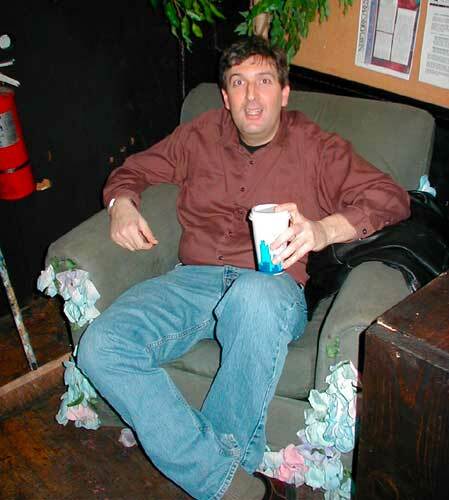 An Armando fun-fact: Armando is best known in Chicago for the long-running show at ImprovOlympic that bears his name (although the show now bears little resemblance to the show he helped create). 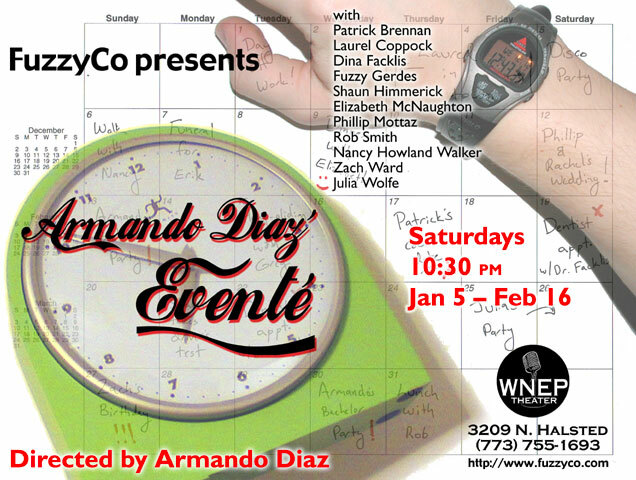 In the old-school Armando Diaz Presents (ADP) form, the monologist would introduce themselves as "Armando", so I've had several people say "Oh yeah, I know who Armando is, he's that skinny blonde guy/guy with the glasses who always wears plaid shirts/red-haired guy." This is Armando Diaz. The project was in the works for a while, but the exact timing of when Armando would be here, and when the show would run, all sort of came together very quickly. Fortunately, this wasn't our first show we've produced in Chicago (and both Shaun and I have produced plenty of shows in Denver and Lafayette, Indiana, respectively). We produced Bare's Actual Theatre this summer, as a co-production with WNEP. Because Armando was only going to be in Chicago for a week or so, we had to have the auditions a few weeks before and we, as producers, would have to cast the show. It did feel a bit odd, because we had already decided to cast ourselves. And Armando's instruction on how to pick the cast for the show was basically "pick a good cast of 10". The auditions were great overall, and in the end, Shaun and I and assistant director Greg Inda picked a cast of 11, because we just couldn't figure out who not to cast to get down to 10. The rest of the cast is Patrick Brennan, Laurel Coppock, Dina Facklis, Elizabeth McNaughton, Phillip Mottaz, Rob Smith, Nancy Howland Walker, Zach Ward and Julia Wolfe. Right after the auditions we got the press release out (it should have been out a few days earlier, but we wanted to include the cast info) and I finalized the poster.